I have been sewing since I was very young. It is my favorite creative outlet. I love making things for my kids and for others' kids. Among my favorite things to make are hybrid fitted cloth diapers. I have been making them for over 5 years. I wanted to share a few things that I currently have ready to ship at my Etsy shop. 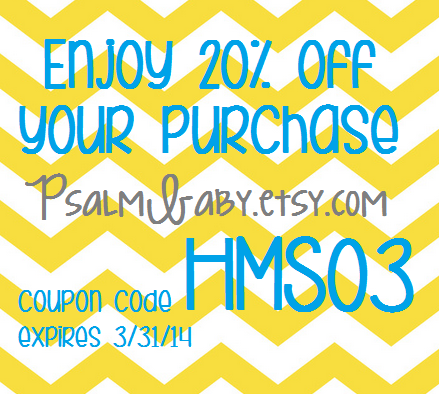 Enjoy 20% off your purchase during the month of March at Psalm Baby at Etsy. Use code: "HMS03"
Follow "PsalmBabyClothDiapers" on Instagram for the latest in stockings and coupons.